Cheetahs are now at risk of becoming extinct, scientists have warned. It is estimated that just 7,100 of the world's fastest land animal remain in the wild, and occupy just 9% of the territory they once lived in. Asiatic populations of the big cats have been hit the hardest, with fewer than 50 individuals surviving in Iran, according to a new investigation led by the Zoological Society of London (ZSL) and Wildlife Conservation Society (WCS). In Zimbabwe, cheetah numbers have plummeted by 85% in just over ten years. The cheetah's speedy decline has prompted calls for the animal to be upgraded from "vulnerable" to "endangered" on the International Union for the Conservation of Nature (IUCN) Red List of threatened species. Dr Sarah Durant, from ZSL and WCS, project leader for the Rangewide Conservation Programme for Cheetah and African Wild Dog, said: "This study represents the most comprehensive analysis of cheetah status to date. "Given the secretive nature of this elusive cat, it has been difficult to gather hard information on the species, leading to its plight being overlooked. "Our findings show that the large space requirements for cheetah, coupled with the complex range of threats faced by the species in the wild, mean that it is likely to be much more vulnerable to extinction than was previously thought." The cheetah is a wide-ranging carnivore and needs a lot of space, which is partly why 77% of its remaining habitat falls outside protected areas, leaving it vulnerable to human impact. 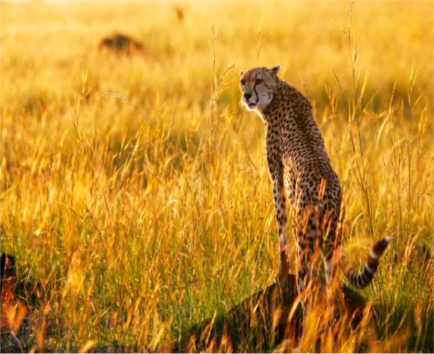 Experts want to see a new approach to cheetah conservation which focuses on the landscape that transcends national borders, and would involve motivating both governments and local communities to protect the cheetah. Dr Kim Young-Overton, from the wild cat conservation organisation Panthera, said: "We've just hit the reset button in our understanding of how close cheetahs are to extinction. "The take-away from this pinnacle study is that securing protected areas alone is not enough. We must think bigger, conserving across the mosaic of protected and unprotected landscapes that these far-reaching cats inhabit, If we are to avert the otherwise certain loss of the cheetah forever."